Q: I have an aeration system but the pond is frozen over, am I still getting aeration? A: Even if you’ve been running your aeration system diligently throughout the winter to protect your fish, it is still possible for your pond freeze over. It is not uncommon for the cold weather to close up the holes created by your aeration system during a streak of particularly frigid winter days. Your pond is able to hold a substantial amount of oxygen which acts as a buffer for days where your pond is getting less than ideal air exchange. Even when frozen, your aeration system will continue to circulate and add oxygen to the water column. Typically a sunny or warmer day will provide the assistance your aeration system needs to re-establish ventilation holes in the ice and release any harmful gas that accumulated while the pond was frozen over. If your pond stays frozen over for more than a week or two at a time you may want to consider using an ice auger to drill a couple holes in the ice around the perimeter of your pond. Do not venture out towards the center as your aeration system is constantly bubbling and weakening the ice. Never try to pound, crack or break through the ice to open a hole for air exchange as it will send pressure waves throughout the pond disrupting and possibly killing your fish. Positioning your aeration plates in shallower areas of your pond will make it easier for the surface water above the plate to remain open due to increased water movement reaching the pond’s surface. If your pond still hasn’t thawed out with the help of warm weather, sunshine and shallow plate placement, inspect your aeration system to make it is properly functioning. If you are using an Airmax® Aeration System, make sure the air filter is clean and is being changed every 3 to 6 months. Check your pressure gauges and airlines for indications that the compressor is still producing adequate air flow. If your system is between 3 to 5 years old consider installing a maintenance kit which replaces all of the seals and wear and tear parts that lead to decreased system performance. If the pressure reads abnormally high it may indicate that your airlines are obstructed by ice or possibly pinched or crushed. If your pond only stays frozen over for short periods of time there is no need to worry. The holes will open back up on their own and your pond will take care of the rest naturally. Continue to regularly inspect your aeration system for signs of trouble and ALWAYS exercise caution when venturing near the ice. Make sure there is a flotation device present at your pond both in the summer and winter. 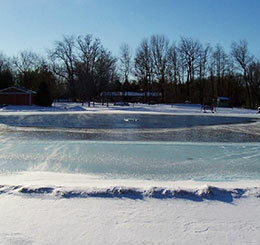 Pond Talk: Does your pond freeze over during the winter, even with aeration?